I don’t want anyone thinking for a second that the word “weird” is there as a pejorative modifier for “kid”. It’s just not that simple. I’m not telling you I was a kid who was weird. I’m telling you that I—and many others like me—belonged to a very specific classification. Though it’s known by many names, the universally accepted term for this creature is the weird kid (weirdicus kidicus). And I was one of them. But like many others, I wore that classification, both then and now, with pride. Once, in kindergarten, I spent the better part of the morning with a rubber snake coiled on my head, claiming to have charmed it into a lull. I was the kid with a Darkwing Duck fanny pack full to bursting with rubber bugs, worms and frogs hot and fresh from my Creepy Crawlers oven. I was the kid who, with shoulders squared and head unbent, walked the halls of Cranberry Elementary in an ensemble of OshKosh B’gosh overalls and those disposable sunglasses they give you at the eye doctor—with confidence so uncompromising as to lend said eyewear all the gravitas of your big brother’s raddest Oakleys. But maybe my weirdest moment was in the third grade, when I brought my Star Wars fan fiction in for the teacher, Mr. Dixon, to read. Of course, I didn’t know it was “fan fiction” at the time. I just knew I had written my own Star Wars story. From what I can remember, that story involved Han Solo becoming a Jedi and battling the Galactic Emperor’s vengeful, evil brother. I can’t remember exactly what happened to this inexplicable villain at the end of the story, but I do know that at some point Leia kicked him in the crotch. In all seriousness, I owe a lot to Mr. Dixon of 3B. He not only read my story but actually urged me to continue writing. That encouragement helped spawn multiple galaxy-far-far-away sequels (featuring one harrowing tale where Boba Fett freezes Chewie in carbonite). It also helped give me the courage to keep on writing and to never hide my weirdness. I may have ditched the overalls, but I’m still writing weird stories. And I don’t plan on stopping anytime soon. Weird kid 4 life. Got any Weird Kid stories of your own? Drop a comment below. I’d love to hear them. 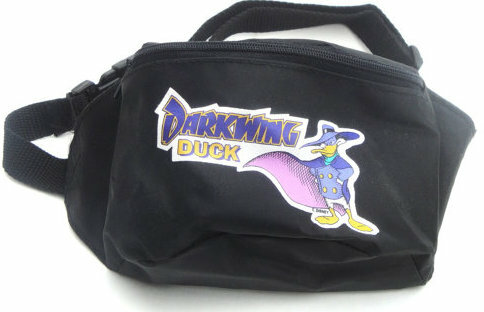 And did anyone else have that Darkwing Duck fanny pack?! I’m pretty sure it came in a cereal box. Posted in Life, Writing.Tagged books, fan fiction, fantasy, fiction, nerd, reading, science fiction, self-publishing, star wars, writers, writing. The professor hopes weird is okay since it surrounds him and is him daily. Is weird okay? The professor can’t help that, you know!